Staff — Ukulele in the Classroom / Ukulele Yes! Meet our staff! These amazing people are helping to spread the joy of ukulele from Toronto to Timbuktu. Spending part of her childhood in Newfoundland, music played a big part in Angela’s life. 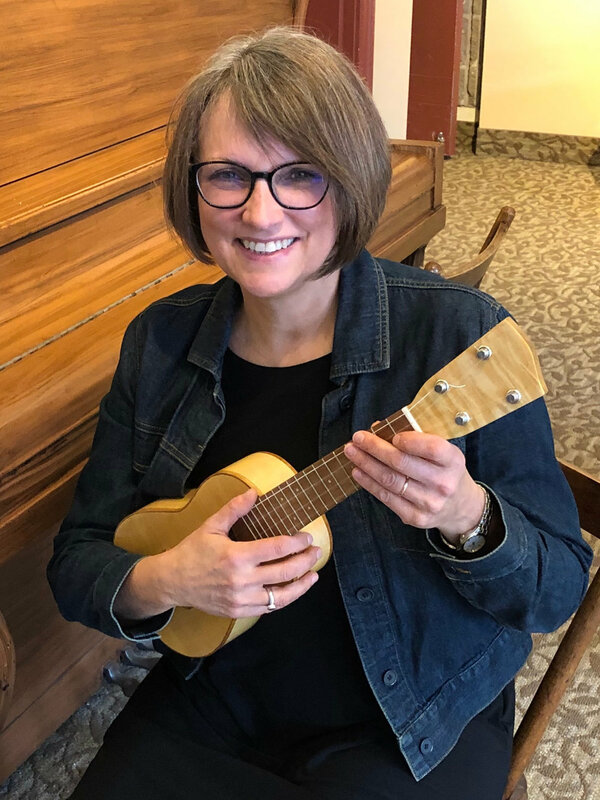 She loved participating in choir, playing the clarinet in the school band, taking piano lessons and also discovered the joys of the ukulele through her involvement in the Chalmers Doane Ukulele program. Her career pursuits took her away from playing music regularly but happily she re-discovered her ukulele and fell in love all over again! A Level 3 JHUI teacher and a Masters student (still working on that thesis! ), Angela is currently Director of the Marigold Ukulele Players as well as a teacher with the Doane Uschool in Truro, Nova Scotia. She also is the Coordinator of the Marigold Ukulele Festival held every two years in Truro. She performs in her community with various ensembles taking her turn on ukulele, double bass and piano. She also sings in her local community choir as well as with the Symphony Nova Scotia Chorus. And life has come full circle as she takes a weekly music lesson with Chalmers Doane at his studio in South Maitland. Danielle’s journey through music, learning and teaching has brought a curiosity into how the mind works processing these things and how people think differently about these concepts. This is not only helping Danielle to better understand how to reach her students on their learning path but helping Danielle to understand how her own mind works, how she best learns and how she fits into the world as well. In her earlier years, Cynthia pursued studies in piano, completing her conservatory levels and a university degree in music. After some years away, it was the mighty ukulele that brought her back to music-making and inspired her to pursue music education again. A Level 3 James Hill Ukulele Initiative teacher, Cynthia currently wears many teaching hats, including providing private music instruction in ukulele and piano; ukulele group classes and workshops; the Royal City Ukulele Ensemble adult learning program; is a sessional lecturer at the University of Guelph; and Director of Engagement for Ukulele in the Classroom. She is also the founder and director of the Royal City Uke Fest in Guelph, Ontario. From an early age Chantal has felt passionate about music and believes in its capacity to nurture the full development of all children. As a parent of young music students and an adult learner she discovered that all human beings, no matter how young or old, have the potential to learn and enjoy making music. Chantal studied piano as a child and into her teens and then classical guitar as an adult student before discovering the ukulele. After meeting James Hill at a school workshop in 2010, Chantal proceeded to complete all 3 levels of the James Hill Ukulele Initiative’s Teacher Certification Program and taught using the Ukulele in the Classroom method in several schools in the OCDSB’s Extra-Curricular Creative Arts program as well as in their General Interest evening program. In the summer of 2014, she was invited to serve as an instructor at the JHUI Teacher Certification institute in Toronto. She also taught the ukulele as an enrichment program to Suzuki music students and parents at The National Capital Suzuki School of Music. Since relocating to Toronto in the summer of 2016, Chantal has mainly served as the social media coordinator for the James Hill Music team as well as for the Toronto Ukulele Orchestra, under the direction of Eve Goldberg. She continues to enjoy learning, arranging and playing all styles of music on the ukulele. Chantal est Franco-ontarienne et peut ainsi offrir services et instruction en français. Zsolt grew up in a small town in Hungary. He and his sister owned two LPs of great kids’ music, but otherwise had to settle for their Dad’s classical rock collection (ultimately, classical rock contributed to discovering the ukulele — in the form of a Queen cover song). They also had a decade of exposure to the Kodály-method used by public schools throughout Hungary. After a short harmonica career and an ever shorter stint in a 17th-century drum corps he started to learn ukulele. Zsolt is very fond of old-time American music and clawhammer-style playing. Zsolt is enrolled in the JHUI Teacher Certification Program where he is currently working toward his Level 1 certificate. He also runs one of the few ukulele clubs in Hungary and is a co-author of the Hungarian ukulele magazine ukulele.hu.